Collection of volatile Ag species on a quartz surface has been successfully achieved for the first time, improving substantially the analytical performance of a previously reported on-line atomization procedure. 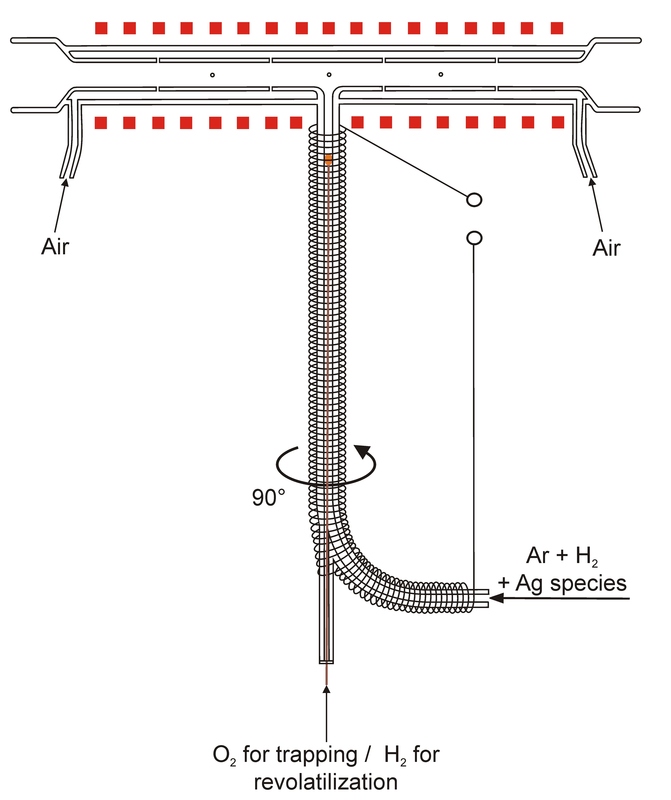 Ag volatile species were formed during the reaction with tetrahydroborate in the presence of chemical modifiers (Triton X-100 and Antifoam B) in a special generator, collected and atomized in a quartz tube atomizer and detected by atomic absorption spectrometry. A novel modular design of the quartz tube atomizer was employed to allow trapping of volatile Ag species inside the optical tube heated to 1000 °C in excess of O2 over H2. Fast revolatilization and atomization of Ag species were subsequently realized by the change of the gas composition to H2 excess over O2. Collection efficiency under optimized conditions reached 94.1 ± 3.2%. The limit of detection was 0.11 ng ml−1 for a 250 μl sample, nine times better than in the on-line atomization mode. Precision expressed as the relative standard deviation of measured trapping peak areas was 3% at the 4 ng ml−1 level. The method was tested using water reference materials. The present shortcomings of this approach such as quartz devitrification at the collection area are discussed and feasible solutions are suggested.